Tests can be challenging enough - creating the tests should not be as difficult which is why ClassMarker has made the adding of questions a very simplified task. Did you know that ClassMarker offers the option to not only add "Fixed questions", but also "Auto-selected" questions to your quizzes? Fixed questions are the same set of questions that will be displayed each time the test is taken. 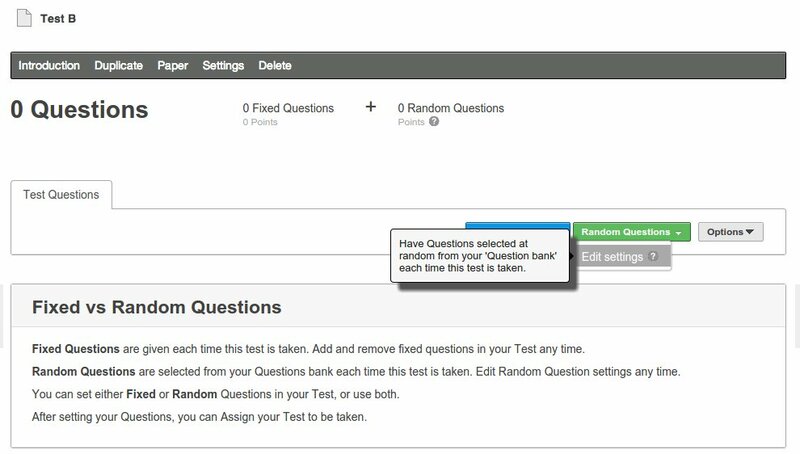 Auto-selected questions, also known as random questions are a set of random questions that are displayed each time the test is taken. You can choose to select all fixed questions, mix it up with both, fixed and randomly-selected questions or just randomly-selected questions. This is just one of the many online testing features that are included with ClassMarker's advanced assessment tool. Today, we are going to go over the ways to add both types of questions, along with how point values will work when calculating randomly-selected questions. First, let's start with adding fixed questions to a quiz. Go to your Question Bank, hover your mouse over "Manage Questions" and select "Add New". 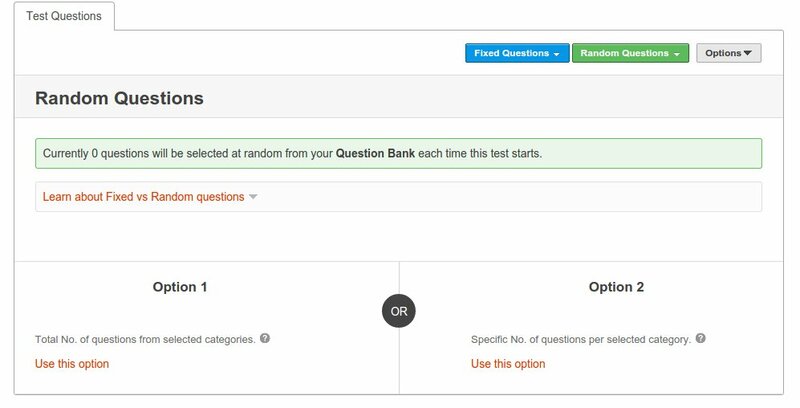 Select the question type and create your question, adjust your questions settings accordingly, such as question point value, the question category and whether you want the answers to be randomized. You have now added a fixed question to your quiz. Adding randomly-selected questions are just as easy to do. Whether you are testing students or training employees, adding your questions only takes a few simple steps to create a quiz that will suit your testing needs. From your Tests page, create a new Test or click "edit" to go to the Test you want to have questions randomly added to. Please note, that when using randomly-Selected, you must already have questions saved in your Question Bank. Hover your mouse over the blue button "Add Questions" and select "Randomly Selected"
You will now see a heading "randomly Selected Questions". Click "Edit Settings". There are two options. "Total Number of Questions from Selected Categories" or "Total Number of Questions per Selected Category". Choose the correct option you want. Option 1 will allow you to select the total number of questions to be randomly chosen from selected categories. Questions will display in random order irrespective of their categories. Option 2 will allow you to select a specific number of questions per category to be randomly chosen. This option allows ordering and grouping of questions by category. You will now be able to make your test accessible for your test-takers by assigning your test. One more thing we do want to touch base on today are the Point Values when choosing to add randomly-selected questions. When you give a test with random questions, you may wonder why you would see different point totals for various users taking the same test. This is because the test is set to pull questions at random, and because you may have questions that have different point values, depending on which questions are selected at random the total points can be different. Feel free to try out the different ways that you can set up your tests and if you do have any questions, please feel free to contact our ClassMarker 24/7 Support Team.